What is Luxury WPC (Waterproof) Flooring? Luxury WPC (Waterproof) Flooring Options Offered by SLCC Flooring. Luxury WPC flooring offers some of the most innovative, versatile, and high-performing flooring available. Here at SLCC Flooring, we offer luxury vinyl tile flooring options with a wood plastic/polymer composite known as WPC for added features and benefits. Together they are known as Luxury WPC flooring. This type of flooring may be seen under other names such as enhanced vinyl plank, engineered luxury vinyl flooring or waterproof vinyl. Luxury WPC Is Different from Traditional Luxury Vinyl Tile (LVT). 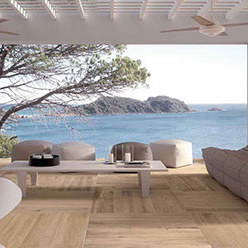 How does Luxury WPC flooring differ from LVT? The main difference is that Luxury WPC is waterproof and can go over most subfloors without much preparation. Traditional vinyl floors are flexible and any unevenness in the subfloor will transfer through the surface. Compared to traditional glue-down LVT or solid-locking LVT, Luxury WPC products have a distinct advantage because the rigid core hides subfloor imperfections. In addition, the rigid core allows for longer and wider formats. With Luxury WPC, it is not necessary to worry about the preparation Luxury WPC would require for use over cracks and divots in concrete or wooden subfloors. 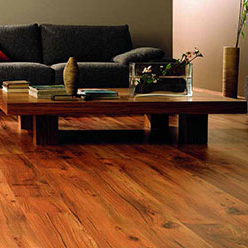 Luxury WPC Flooring is Waterproof & Scratch-Resistant. Luxury WPC flooring is strong on the top, but soft on the feet – maintaining a comfortable temperature throughout the seasons. 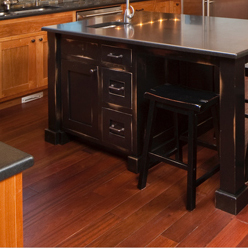 One of the main attractions of Luxury WPC flooring is its waterproof design – making it a viable option for kitchens and other high-traffic areas where spills may occur on accident. 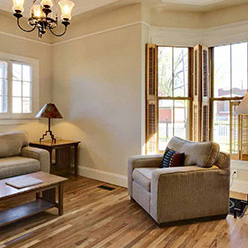 There are many other benefits offered by Luxury WPC floors. Flexibility – including large format shapes & sizes. Unique designs and patterns not offered by other flooring options. Realism in every design with high fidelity printing techniques and proprietary embossing methods. Durable, long-lasting performance able to withstand heavy foot traffic from children & pets. More rigid and dimensionally stable than traditional luxury vinyl tile (LVT) flooring. Provides industry-leading resistance to scratches, stains, scuffs, and other minor to medium damage. Easy to care for & maintain. Backed by our 25-year warranty! Fill out the form to schedule a consultation with us for Luxury WPC Flooring.